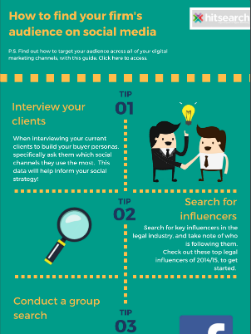 Law firms, struggling to find your audience organically on social media? This graphic is for you! It's important you can competently interact with your audience across all digital channels, but with over 2 billion active social media users, your firm needs to understand the importance of social media. So, if you need a helping hand finding your audience on social media, then download this infographic to access 5 tips to get you started! Download this infographic by filling in the form to the right!